339 Commonwealth (22 Fairfield) is located on the NE corner of Commonwealth and Fairfield, with 235 Commonwealth to the east, 21 Fairfield to the west, across Fairfield, 20 Fairfield to the north, across Alley 426, and 30 Fairfield to the south, across Commonwealth..
239 Commonwealth (22 Fairfield) was designed by Sturgis and Brigham, architects, and built in 1882-1883 by D. Connery & Co., masons, and Benjamin D. Whitcomb, carpenter, as the home of Nathaniel Thayer, Jr., and his wife Cornelia Street (Barroll) Thayer. 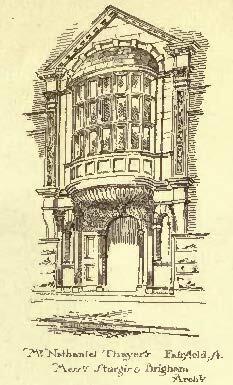 As originally built, the entrance was on Fairfield and the address was 22 Fairfield. He is shown as the owner on the original building permit application for 22 Fairfield, dated May 9, 1882. 22 Fairfield (239 Commonwealth) was built on a lot with a 47.2 foot frontage on Commonwealth. Nathaniel Thayer, Jr., purchased the corner lot, with a 41.57 foot frontage on November 22, 1880, from Ellen A. (Larrabee) Johnson, the wife of Henry M. Johnson. He combined it with a 5.63 foot wide lot to the east, part of a 26.63 foot lot he purchased on April 30, 1881, from Frederick Sears Grand d’Hauteville. In October of 1882, Nathaniel Thayer sold the remaining 21 feet of this lot to George Wheatland, Jr., who built his home there at 235 Commonwealth. On May 10, 1881, prior to his selling the lot to George Wheatland, Jr., Nathaniel Thayer, Jr., entered into an agreement with Frederck Sears Grand d’Hauteville that, for a period of twenty years, no stable would be built on the land where 235 Commonwealth and 239 Commonwealth subsequently would be built. The restriction was for the benefit of the owner of land at 233 Commonwealth, which Frederick Sears Grand d’Hauteville continued to own. 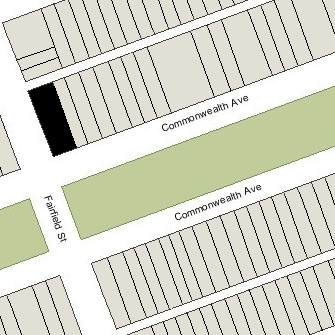 The land for 22 Fairfield (239 Commonwealth) was part of a larger parcel on which 233-235-239 Commonwealth subsequently were built. It was originally purchased from the Boston Water Power Company on February 16, 1863, by Daniel Davies, Jarvis Dwight Braman, and Grenville Temple Winthrop Braman. Grenville Braman was treasurer of the Boston Water Power Company, Jarvis Braman was his brother (and later president of the company), and Daniel Davies, a housewright and master carpenter, was Grenville Braman’s father-in-law. Click here for an index to the deeds for 239 Commonwealth (22 Fairfield). 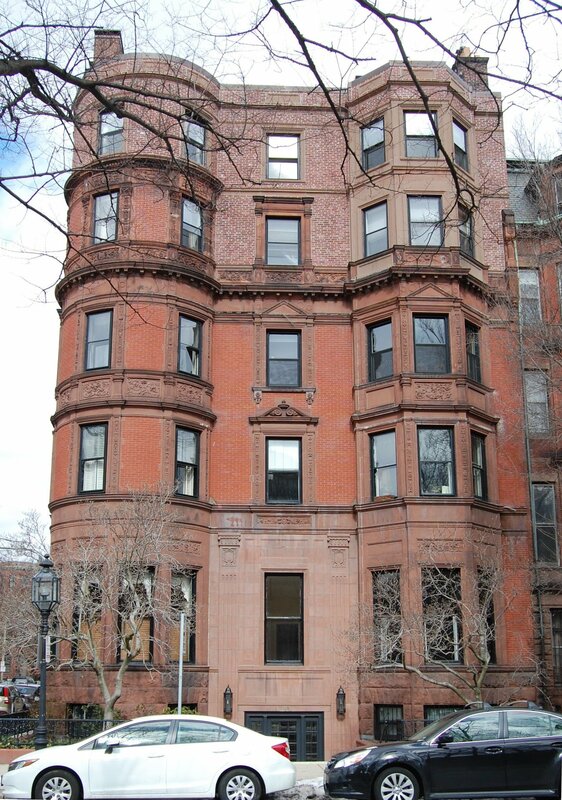 By 1884, Nathaniel and Cornelia Thayer had made 22 Fairfield their Boston home. They previously had lived at 70 Mt. Vernon. They also maintained a home in Lancaster. He was an investor in railroad, textile, and land companies. 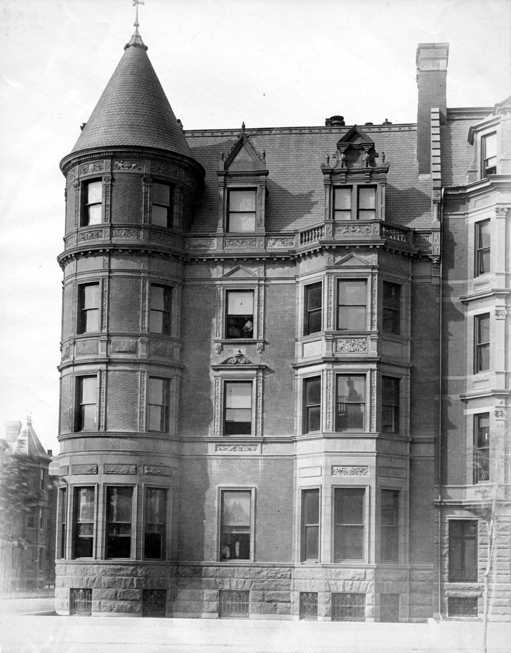 In her book, Ogden Codman and the Decoration of Houses, Pauline C. Metcalf indicates that the Thayers retained Ogden Codman, Jr., to provide interior decoration of their Boston home. Cornelia Thayer died in February of 1885, and in June of 1887, Nathaniel Thayer, Jr., married again, to Pauline Revere. After their marriage, they lived at 22 Fairfield and in Lancaster. 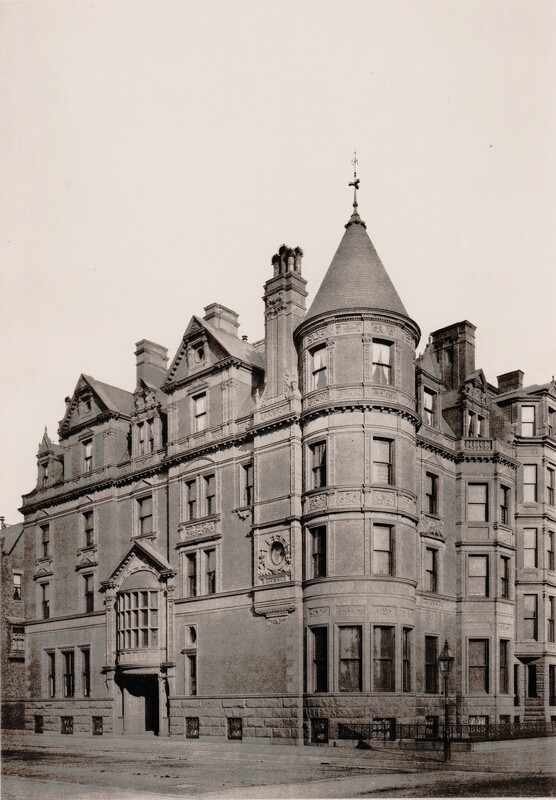 Pauline Thayer was one of the founders of the Chilton Club (152 Commonwealth) in 1910, and served as its president from its founding until her death. Nathaniel Thayer, Jr. died in March of 1911. Pauline Thayer continued to live at 22 Fairfield until her death in September of 1934. She also maintained homes in Lancaster and Newport. On December 31, 1936, 22 Fairfield was purchased from the estate of Nathaniel Thayer, Jr., by Louis Marden of Winthrop, president and treasurer of the Marden Construction Company. In December of 1936, he filed for (and subsequently received) permission to remodel the property and convert it from a single-family dwelling into twenty-one apartments. As part of the remodeling, the entrance was moved to Commonwealth Avenue and the address changed to 239 Commonwealth. The upper floors were remodeled, increasing the height and converting the fifth floor into two stories, making the building a six story building. The remodeling was designed by architect Herman L. Feer. On November 10, 1938, Morris Goldfine foreclosed on a mortgage from Louis Marden and sold 239 Commonwealth to Anna Weiner. On May 25, 1939, she transferred the property to real estate dealer Ray C. Johnson, who conveyed it on the same day to Falmouth Shores, Inc., of Newton (William T. Rich, Jr., president and treasurer). In December of 1939, Falmouth Shores (shown as Falmouth Acres, Inc., on the application) applied for (and subsequently received) permission to add a bay at the sixth floor. The property changed hands and on May 4, 1944, 239 Commonwealth was acquired by Realty Owners, Inc. (Herman Louis Tritter, president and treasurer). On December 30, 1958, Realty Owners, Inc., transferred 239 Commonwealth to Herman Tritter and his wife, Rose G. (Greenblatt) Tritter, trustees of the Realty Owners Trust. Herman Tritter died in September of 1961. On April 1, 1963, Rose Tritter, as the surviving trustee of the Realty Owners Trust, transferred 47/80ths interest in 239 Commonwealth to herself and 33/80ths interest to herself and her brother-in-law, Dr. Abraham Eugene Kateman (husband of Jeannette (Greenblatt) Kateman), as trustees under Herman Tritter’s will. 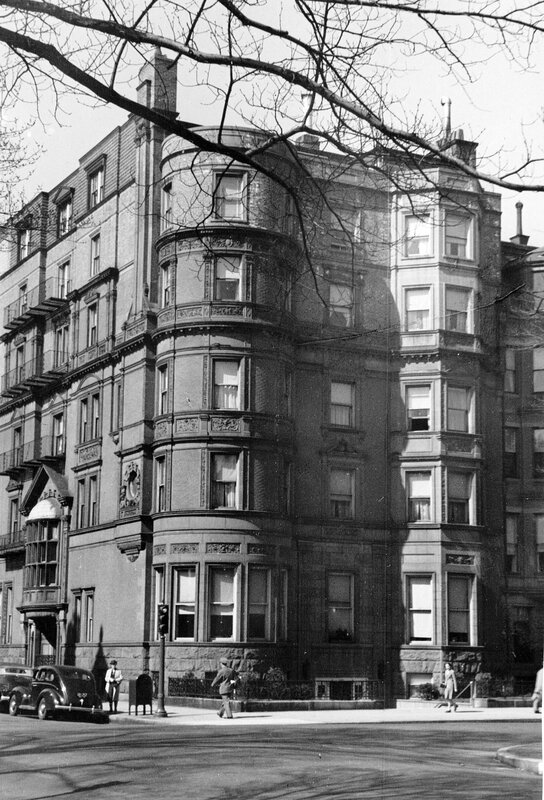 On May 29, 1963, 239 Commonwealth was acquired from Rose Tritter and Herman Tritter’s estate by Alvin L. Lipsky and Benjamin Lipsky, partners doing business as Alben Realty. On January 4, 1971, 239 Commonwealth was acquired from Alben Realty by Pierre Louis de Bourgknecht. On July 8, 1985, 239 Commonwealth was purchased from Pierre de Bourgknecht by John R. Giles, trustee of the 239 Capitol Realty Trust. 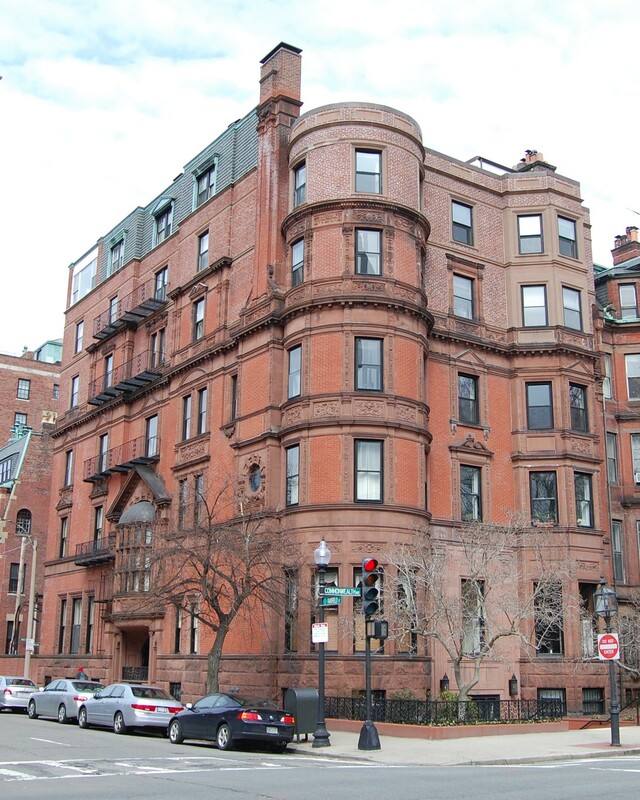 On the same day, he converted the property into twenty-one condominium units, the 239 Commonwealth Ave. Condominium. In June of 1997, a unit owner filed for (and subsequently received) permission to combine units 42 and 43, reducing the number of units from twenty-one to twenty. And in February of 2000, another unit owner filed for (and subsequently received) permission to combine units 61 and 62, reducing the number of units from twenty to nineteen.